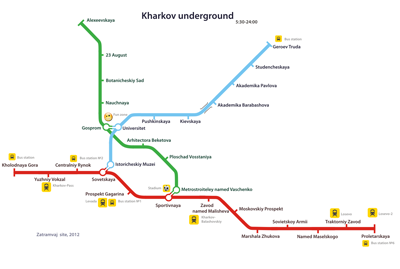 Currently, the city of Kharkov Subway consists of three lines: Kholodnogorsko-Zavodskaya line, Saltovskaya line and Alekseevskaya line. 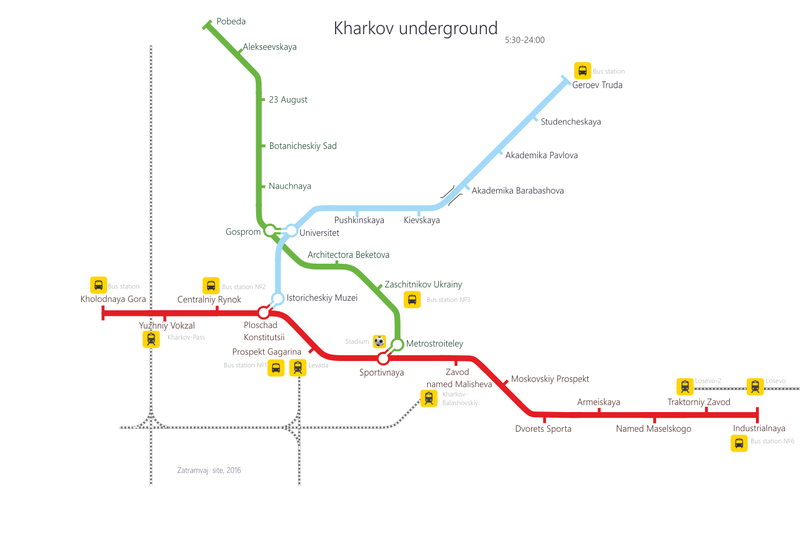 The total length of subway lines Kharkov is over 35.5 km. Each year, Kharkiv subway carries around 300 million people. Kharkiv subway opens at 5:30 am and closes at midnight. During “rush hour” the interval between trains is 2-3 minutes, in the afternoon 5-10 minutes, and late at night you can wait over 10 minutes, so pay attention when switching trains. Movement of trains on the longest-Holodnogorsko-Zavodskaya branch takes about 45 minutes. The end-station to the center can be reached, on average, in 20-25 minutes.